Calling the climate change that a proposed gas-fired power plant that Invenergy LLC proposes to build in Burrillville a “existential threat”, environmental and conservation groups led reporters and others on a tour of Pulaski State Park Tuesday to point out lands and animals they say are vulnerable to construction and potential pollution impacts. A half-dozen groups, organized by the Burrillville Conservation Commission offered criticism of the Invenergy plant, including Save The Bay, The Nature Conservancy, the Blackstone Valley Tourism Council and others. “Audubon opposes the Invenergy power plant, because climate change is the existential threat facing birds and wildlife and people,” said Meg Kerr, Senior Director of Policy for the Audubon Society of Rhode Island. 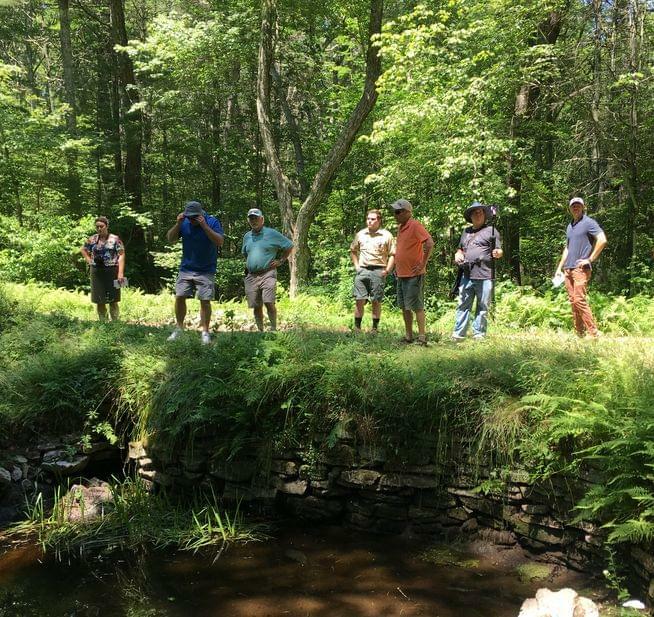 “This indeed is a forest in jeopardy,” said Lisa Mosczynski, President of the Metacomet Land Trust which preserves open space in 15 communities in the Connecticut, Massachusetts and Rhode Island area. “This site was rejected for the Ocean State Power Plant in the past. It must be rejected now,” Mosczynski said. “Any given day, you have people swimming, fishing hiking just a stone’s throw away… and it’s important that we preserve this, because it was meant to be preserved,” said Kevin Cleary, Chairman of the Burrillville Conservation Commission as he wrapped up about a two-mile guided hike around Pulaski State Park and Recreational Area, pointing out birds, wildlife habitats and natural formations along the way. Cleary said the tour and speaking program was organized because the Rhode Island state Energy Facilities Siting Board will soon continue a series of hearings into the proposed power plant. A continuation of final hearings which started in the spring are set to resume on Thursday, July 19, at 9:30 A.M. and may continue on July 24 & 25. At last! The RI public, who own the Pulaski and George Washington Forests, get to see the essential point: This where Invenergy and Governor Raimondo propose to build the largest new gas-fired power plant in New England. The proposed power plant site shares a border of several thousand feet with the George Washington Wildlife Management Area approximately 3 miles northeast of the Pulaski Recreation Area. The site is NOT, as the Projo erroneously reported it in their story of this press conference, “in Pascoag village.” Pascoag village is a mile and a half southeast of the power plant site.